The MacBook Air just might be the greatest laptop ever made, it’s extremely light, powerful, has an amazing battery life, and somehow packs all of that into an affordable package. To get the absolute most out of this wonderful Mac, you’ll want to run through these four (well, technically six) essential tips, which cover what I routinely recommend for every MacBook Air owner. Whether you just got a brand new Air for the first time or you’ve been a longtime Air owner, you’ll get a better looking display, more screen real estate, better battery performance, and a better handling of the limited storage capacity offered through the superfast flash drives. Take a moment to check the manufacturer of the MacBook Air’s internal display, and then to calibrate the display if you have an LG panel. This is not to suggest that some panels are inferior to others, they’re all excellent, it’s just a matter of the default color profile used. Air models with Samsung displays seem to fit the default color profile better than Air models shipped with LG panels, which look significantly better after running through a calibration. If you see something prefixed with “LP” reported back, you have a display panel that should be manually calibrated to look it’s best. The effect is very hard to demonstrate in screen shots because images don’t carry display profiles, you really need to check this yourself and run through calibration (or use a pre-made Air color profile for LG displays) to see the remarkable difference that is possible. The gist is that after a proper calibration, colors on the MacBook Air display will appear brighter and contrast will increase, making the display look significantly improved. 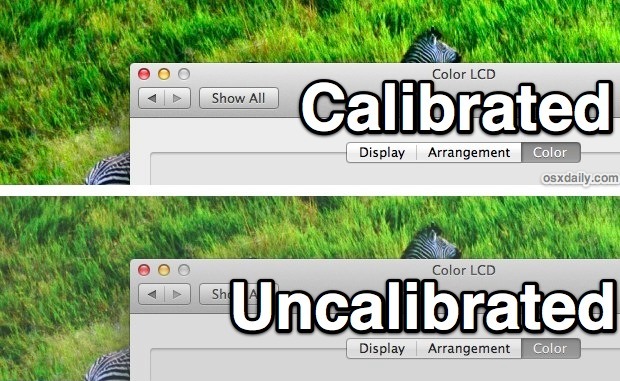 Display calibration only takes a minute or two with “Expert Mode”, just be sure to calibrate colors in a neutrally lit environment with the brightness temporarily turned up to get the best results. Taking apps full screen makes the best of the smaller screen sizes of the MacBook Air, which is particularly important on the 11″ model, but still has nice benefits on the 13″ Air. Just toggling the Full Screen button in the corner of most apps is all it takes, or set a keyboard shortcut for this purpose if that’s your preference. When not working full screen, having the Dock automatically hide itself is another great way to save some screen real estate. All that’s necessary to achieve that is to hit Command+Option+D, and the Dock will automatically disappear and reappear again when you hover the cursor near it. Or you can toggle it yourself in the Dock settings. These are the two simplest tricks to get the best use of a smaller display, but we’ve covered more tips for being productive with small screens before if you’re interested in some more advanced solutions. For best results, go with 50% (or less) screen brightness, and quit out of every single app that isn’t necessary for the task at hand. A simple trick for the latter is to use a DIY quit-all function and then selectively launch a single app or two that is needed to get the job done, keeping background activity to a minimum. Want even better battery life? follow some other tips to further boost that battery, relevant to all MacBook’s be them an Air, Pro, Retina, or whatever else you’re rocking. And don’t forget to upgrade to OS X Mavericks when possible, because it has some serious battery enhancing features. Perhaps the only weakness of the MacBook Air is the size of onboard SSD storage, which can be inadequate when compared to laptops that use old fashioned hard drives. Fortunately, cheap external storage is now the norm, and it’s very easy to augment the lightning fast built-in drive with affordable and portable external solutions. Owners of the 13″ model should spend a bit to grab a sizable SD card with decent storage capacity, which tucks nicely into the card reader on the side and adds a lot of storage capacity for a tiny price tag, making it a great place to store media files, movies, photos, downloads, and other stuff that doesn’t necessarily need to be on the primary drive. Unfortunately, 11″ Air owners don’t get the SD card option, but an external micro USB Flash drive can make a decent compromise and still remain small enough to not be a nuisance even if it does stick out of a USB slot. Speaking of external storage, grab a large external portable drive and partition it to serve as both a general use media drive and Time Machine destination. This allows you to share a single drive for backups and file storage and avoid a tangle of cables whether you’re on the go or at a desk.